(Mens L) Ugly Xmas Sweatshirt! Mickey & Minnie Mouse Seasons Greetings! Home > Ugly Christmas Sweaters > Ugly Christmas Sweatshirts > (Mens L) Ugly Xmas Sweatshirt! Mickey & Minnie Mouse Seasons Greetings! Vintage ugly Christmas sweatshirt! 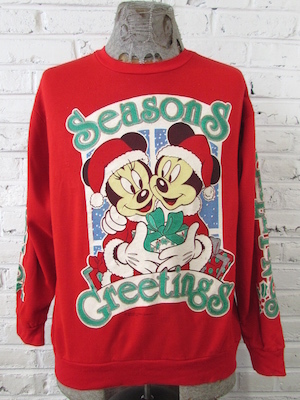 Red sweatshirt with puffy paint Mickey & Minnie Mouse wearing Santa outfits, cuddling and exchanging gifts! They are framed by the words �Seasons Greetings�, written in green and silver glitter puffy paint. The phrase appears again on the sleeves with the word �Seasons� on the right sleeve and �Greetings� on the left sleeve. Tagged by The Walt Disney Company. 100% Acrylic. Condition: Very Good. Has some pilling throughout the sweatshirt. There are also two spots in the front of the sweater that have had holes repaired. Does not detract from the awesomeness of this sweater! Sleeves: 29" collar to cuff.